The Kroeber 240 v oxygen concentrator with digital incremental flow settings of 0.1 LPM is an ideal paediatric oxygen concentrator. 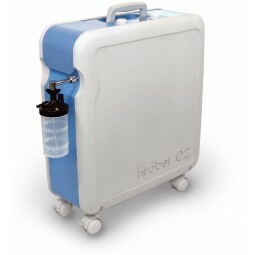 It is a complete microprocessor-controlled oxygen concentrator with USB – interface and oxygen measuring sensor. This stationary concentrator has a sleek modern design. With a smooth and simple operation, modular components and easily accessible filter and fuses. This easy to move unit not only boosts its own integrated flow adjustment,, but it comes complete with a carrying handle and roller castors. This particular stationary device operates quietly meaning virtually silent running. We also have an extensive range of Reconditioned and Ex-demonstration units – Contact Us for more details. Need help? Why not call us for expert advice!